There may be no other place where quality curtains and tracks are so important, and yet so overlooked, than on stage. This is alright with us because the track and curtain are supposed to blend into the background and let the action on stage get all the attention. The only time people notice the onstage curtains is when they are stuck, sagging, or otherwise not doing their job. Our stage and theatre curtains, tracks, and drapery hardware are of the highest quality and promise to leave your audience oblivious to their presence. Our tracks have performed on small stages, in big theatres, schools, churches, and recreation centers among others, and have provided the backdrop for all kinds of performing acts. Whether you are pulling a rabbit out of a hat, reciting Shakespeare, or tripping the light fantastic, if you are doing it on a stage, we have what you need. Of course, our tracks don’t always play a background role. In some cases they are integral to the movement of props and stage-set elements. But whether they are part of the background, or taking a starring role, they need to handle the weight of the curtains or set elements, which are often quite heavy. They also need to stand up to some rough treatment (depending on the show)! We have a wide selection of tracks that work well in this environment, but our toughest tracks are the 3120 Extra Heavy Duty Curtain Track, and the 6200 Heavy Duty I-Beam Track. The 3120 track in an anodized aluminum track available in silver and black with a thicker top wall for added support. This track uses sturdy double wheel or short snap carriers. The 6200 track is an aluminum track that can be mounted on the ceiling or wall, and requires metal block carriers. To finish off your stage, we offer curtains in Eclipse fabric, which helps absorb sound and blocks 98% of light. It is a heavy-duty fabric available in a variety of lengths and widths. 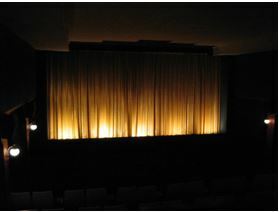 We would love to help you install your theatre curtains and tracks. Give us a call to find the right track, drapery hardware, and curtains for your space: 888-434-7444.